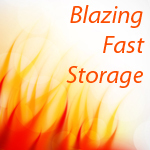 WildFire Storage is based on EasyCo's patented Enterprise Storage Stack, first developed in 2006. The stack is a software layer designed to create a perfect storage stream. With our storage stack, storage devices such as SSDs, hard disks, and even USB sticks see perfectly aligned, long, linear writes, regardless of whether the source data is linear or random. These linear writes are immensely faster than scattered random writes. They also radically reduce wear amplification in flash media. Perfect Flash Performance: the WildFire all-Flash stack writes at the linear speed of the device or array. This involves keeping the block IO patterns "perfectly aligned" at all stages. An 8 drive RAID-5 array with SSDs that linear write at 500MB/sec, can write random data at 3.5GB/sec or 850K 4K random write IOPS. Larger arrays have been benchmarked at over 2.5M IOPS. More importantly, the reduced wear amplification of our design preserves performance in a way that other solutions can't. Minimal Flash Wear: our stack reduces the wear amplification of Flash SSDs, as well as RAID amplification and data amplification. ESS can improve system-wide flash wear, for a given workload, by as much as 40:1. This lets you use less durable and less expensive flash in storage devices while still achieving durability goals. For instance, consumer (1,500-3,000 endurance) flash can achieve data center performance expectations. With consumer flash, you can expect 5 year life even with an overwrite per day and minimal over-provisioning. Higher Data Integrity: a number of features are designed into our storage stack to increase data integrity beyond levels normally available in source media. High Speed BonFire SAN: Our BonFire SAN software is designed to make SAN management a pleasant and easy experience. Most BonFire management sequences occur in sub-second real time. BonFire supports both ZFS for hard disk management as well as ESS arrays for Flash SSDs. Unmatched value: Wildfire Servers are far and away the value leader in Flash storage appliances, both in terms of $/GB and $/IOPS. No one else is even close.